Using a brand-new radio telescope, astronomers have produced one of the best images ever made at the lowest frequencies of giant bubbles produced by a supermassive black hole. The observations were performed at frequencies ranging from 20 to 160 MHz which are normally used for communications by airplane pilots. The picture shows what looks like a giant balloon filled with radio emitting plasma, which exceeds the size of an entire galaxy. Some black holes actively accrete matter. Part of this material does not fall into the black hole but is ejected in a narrow stream of particles, traveling at nearly the speed of light. When the stream slows down, it creates a tenuous balloon that can engulf the entire galaxy. Invisible to optical telescopes, the bubble is very prominent at low radio frequencies. The new International LOFAR Telescope (ILT) , designed and built by ASTRON in an international collaboration, is ideally suited to detect this low frequency emission. “The result is of great importance”, says Francesco de Gasperin, lead author of the study that will be published in the journal Astronomy & Astrophysics. 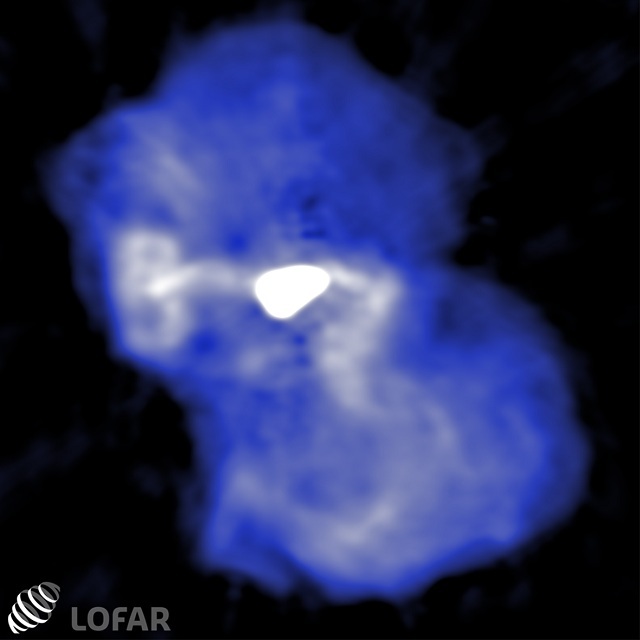 “It shows the enormous potential of LOFAR, and provides compelling evidence of the close ties between black hole, host galaxy, and their surroundings. Like symbiotic species” adds de Gasperin, “a galaxy and its central black hole lead intimately connected lives, the galaxy providing matter to feed the black hole, and the black hole returning energy to the galaxy”. 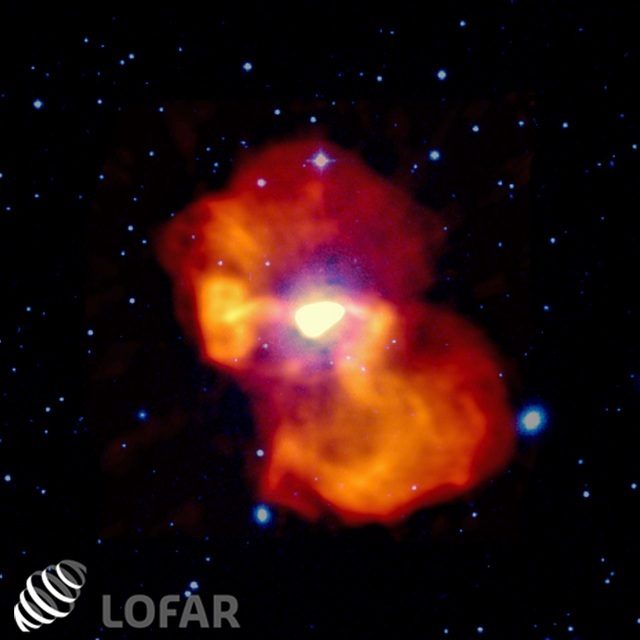 The image was made during the test-phase of LOFAR, and targeted the giant elliptical galaxy Messier 87, at the center of a galaxy cluster in the constellation of Virgo. This galaxy is 2000 times more massive than our Milky Way and hosts in its center one of the most massive black holes discovered so far, with a mass six billion times that of our Sun. 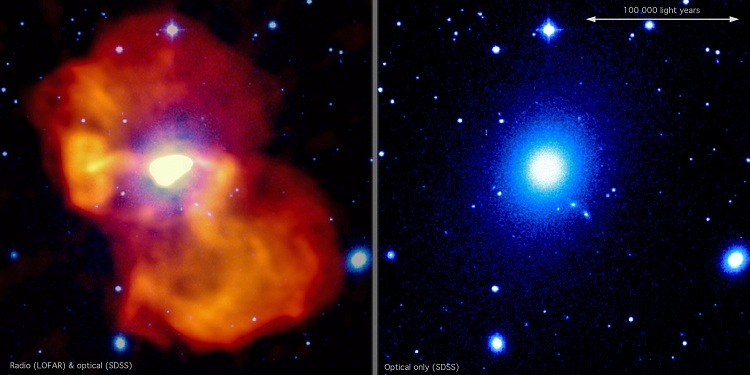 Every few minutes this black hole swallows an amount of matter similar to that of the whole Earth, converting part of it into radiation and a larger part into powerful jets of ultra-fast particles, which are responsible for the observed radio emission. To determine the age of the bubble, the authors added radio observations at different frequencies from the Very Large Array in New Mexico (USA), and the Effelsberg 100-meter radio telescope near Bonn (Germany). The team found that this bubble is surprisingly young, just about 40 million years, which is a mere instant on cosmic time scales. The low frequency observation does not reveal any relic emission outside the well-confined bubble boundaries, this means that the bubble is not just a relic of an activity that happened long ago but is constantly refilled with fresh particles ejected by the central black hole. Francesco de Gasperin performed the study as part of his PhD work at the Max Planck Institute for Astrophysics and at the Excellence Cluster Universe. De Gasperin is now a postdoctoral researcher at the University of Hamburg.